Thank you for your continuous support to Hong Kong National Ice Hockey Team. The HongKong Ice Hockey Association (HKIHA) cordially invites HKIHA members and HKIHA Registered Club members to apply to participate in the national team in the purpose of preparing the Hong Kong National Ice Hockey Team to participate in the future international ice hockey competitions. All participants must be male, be born before 1999, and must hold valid HKSAR passport. 4. Must hold valid HKSAR passport. There are total 6 practices, each 1.5 hours. 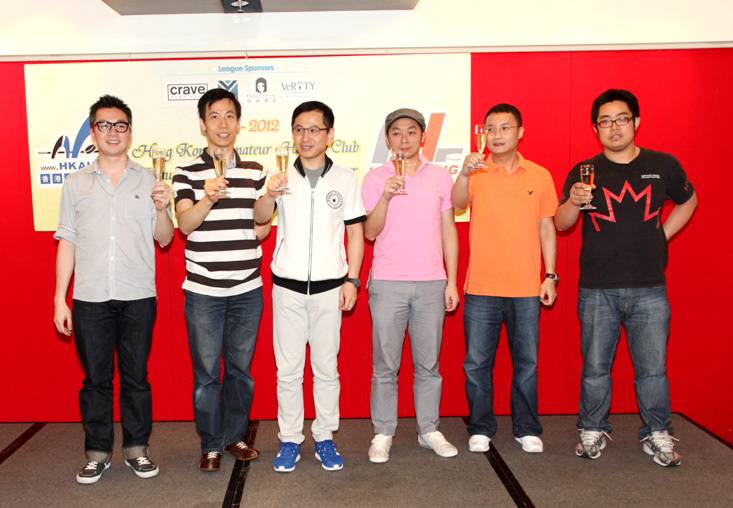 A one-off entry fee of HK$900 is required for each participant which is non-refundable. If participant shall not be able to attend one or more practices, there will be no refund for those missing practices. If you are interested to join, please complete and submit the attached entry form by July 5th, 2012, along with a cheque of HK$900 payable to “HongKong Ice Hockey Association Limited” and mail to Room 1023, Olympic House, 1 Stadium Path, Causeway Bay, Hong Kong or settle the fee by bank transfer. Please send us the receipt by email or fax 2504 8191 for our record. Receipt must be emailed or fax to 25048191 for the confirmation of payment. There are total 7 practices, each 1.5 hours. A one-off entry fee of HK$350 is required for each participant which is non-refundable. If participant shall not be able to attend one or more practices, there will be no refund for those missing practices. If you are interested to join, please complete and submit the attached entry form by July 7th, 2012, along with a cheque of HK$350 payable to “HongKong Ice Hockey Association Limited” or settle the fee by bank transfer. Please send us the receipt by email or fax 2504 8191 for our record. Eligible age group from 95-00 (HKSAR Passport holder), younger players may apply, HKIHA Executive committee will make the final decisions. Receipt must be emailed or fax to 2504 8191 for the confirmation of payment. HKAHC organizes a two-day Referee & Scorekeeper Clinic – this an introduction course for players and teachers for ice hockey rules and helps you to step forward if you’re interesting to become an On-Ice or Off-Ice Official. We sincerely invite you to come and join our clinic. All new comers (non-experienced officials) are welcome. To sign up or should you have any enquiry , please contact Stanley (2863 4357/ stanley.shum@hkahc.com) or Ricky (2863 4241/ ricky.pang@hkahc.com)! This is an annual 3-on-3 tournament organized by Malaysia Ice Hockey Federation (MIHF). This year, the MIHF would like to invite us to join the tournament. Game Format: 3-on-3 for the Women, Asian and International divisions while the Youth division will go 4-on-4. Penalties will result in penalty shots, to be taken at the end of the game. If you are interest to join the tournament, please contact Stanley (stanley.shum@hkahc.com) for further details! HongKong Ice Hockey Association Limited (HKIHA), member of the International Ice Hockey Federation (IIHF), is invited by IIHF to participate in the 2012 Hockey Development Camp from 15 to 22 July 2012 in Vierumaki, Finland. The 2012 IIHF Hockey Development Camp is to educate the future leaders of women’s ice hockey throughout the world and to develop and enhance the skills of women’s hockey leaders of member National Associations. Thank you for your kind attention. Should you have enquiries, please feel free to contact HKIHA. HKIHA is very excited to organize our first Hong Kong Junior Ice Hockey Leauge (summer) - Honorary President Cup. With our new Honorary President Mr. Thomas Wu and his passion for ice hockey and the generous support to HKIHA making the Junior league possible. This is an exciting time of the year to play hockey in the summer time during the morning hours. For many of us don't have chance to play outdoor hockey, the feeling of sun shining down on the ice, and feel the cool of ice. We can do exactly that this summer time with the HKIHA hosting the first ever Hong Kong Junior League (Summer). The announcement are attached and if you have any queries, please feel free to call us. We hope all the players in Hong Kong will enjoy this summer season playing the coolest game on earth at the hot summer time at Mega Ice. Application Deadline is May 11, 2012. Please join us to make this the better future of Ice Hockey in Hong Kong. Thanks! 2011/12 HKAHC Annual Dinner completed ! 2011/12 HKAHC Annual Dinner completed in the KITEC, Kowloon Bay on 28 April 2012. All players enjoyed the meal and have good sharing with other players during the dinner gathering. The awards for Season League and Playoffs were presented during the dinner, which to show our appreciation to players and helpers throughout the year. Besides the award presentation, we had a very excited lucky draw. Acknowledge to ASN sponsored 2 Stanley Cup 2012 Final Game #3 tickets; Mega Ice sponsored one-year pass to the ice rink; Meco Phoneix Club, Adidas Hong Kong Ltd. and all sponsors giving out presents for lucky draw. Congratulation to all awarded players and lucky draw’s winners! It was an exciting event held this past weekend in Nanjing. Both Atom and Pee Wee division participants worked hard this season at all 3 legs in Beijing, Harbin and Nanjing. Their commitment and dedication is appreciated by the coaches and the league. This year we have included both ranking and playoff championships. The Harbin Ice Hockey Gymnasim (Harbin) Pee Wee team was ranked number one throughout the season as were the Hong Kong Academy of Ice Hockey (HK) in the Atom division. The Atom playoffs were represented by Hong Kong and Harbin, while the Pee Wees were contested by Harbin and Beijing Century Star (Beijing). The HK Atoms defeated the Harbin team while Beijing won in a shootout game against the Harbin Pee Wees. Once again congratulations to all and we look forward to next year's AYHL season. The HKAHC wishes to send out a reminder to all players, reinforcing our zero-tolerance for violent play. Hockey is a fast, contact sport - this is why we love the game - but we need to keep our emotions in check. As a non-hitting league, we encourage our players to play hard, and use good checking and skating angles to gain possession of the puck. Lately we have seen a rise in aggression in the corners and in front of the net and hope everyone can work together to keep our league the fun, competitive recreational HKAHC we love. When the goaltender has covered the puck, we are taught to play until the whistle blows, but we need to be reasonable and use common sense. Nobody wants to be slashed in the hand simply because someone feels they have the right to do it if the whistle hasn't been heard. At the same time, defensemen need to remember this is not the NHL, and there is no need to shove and punch people simply for being near your goalie after the whistle. We take pride in the fact that our league is both competitive and fun for all who play, let's not tarnish that.